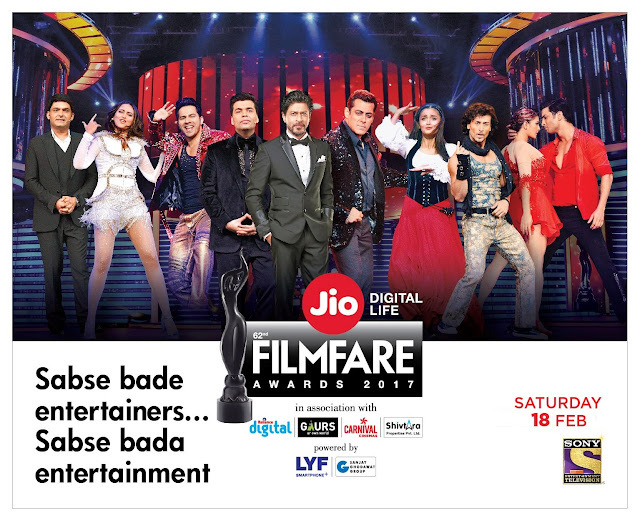 Filmfare award has been a prestigious award in the Indian film industry and is set to honor the most exceptional performance of the Indian cinema .This year the event was held on 14th January, 2017 in Worli, Mumbai and the show will be aired on Sony TV Tonight. Many Hindi TV channels had fought hard to get the telecast rights for this Filmfare award. This year Filmfare has partnered with Jio for this Filmfare awards and will also be showcased digitally across Jio apps. Get ready to watch the magnificent and stunning performance on Sony TV. Kapil Sharma and Karan Johar were the nights' hosts and both of them are known for their humor and it will be amazing to see them together on the stage for the biggest award night . Alia Bhatt will also host a segment of the show. With her surprise inclusion which got most of the whistles and claps. Varun Dhawan set the stage on fire with his electrifying performance by performing and paying tribute to Bollywood all time favourite dancers, including Mithun Chakrabarty, Govinda and Hrithik Roshan. Macho Mr Khan - the Dabangg actor also performed and all the girls went wild for his stellar dance moves. Tiger Shroff set the stage blazing by paying a tribute to Michael Jackson, Prabhu Deva and Hrithik Roshan. It got little emotional though when his father Jackie Shroff joined him on stage and the senior actor played a tune from his iconic movie "hero"
Best female Playback Singer: Neha Bhasin the song "Jag Ghoomeya"
Get ready and glued to your seat and be ready to be entertained tonight, Watch Filmfare on Sony TV Live.